Through my business, FOOD LOVE, I’ve taught several Valentine’s day cooking lessons. The phone call typically comes from the guy in the relationship. He shares with me how his girlfriend or wife loves to cook, how she is always lamenting that she wants to be more creative in the kitchen, and how she has mentioned more than once that she wants classes. I’m always a bit apprehensive about these calls. They seem to fall in that dangerous gift category of blenders or vacuum cleaners. Gifts that are practical, but not exactly romantic. I can easily imagine how the conversation progresses once the gift is unwrapped. Are the floors not clean enough for you, dear? Do I NEED cooking lessons? I get anxious just thinking about it. Things really start getting interesting when these thoughtful gents decide they would like the cooking class to be a surprise. The excited husband tells his wife that he’s got a fun night planned, his wife gets dressed up for a special and relaxing evening, I show up with dinner in the form of ingredients, and the wife, in heels and a cocktail dress, has to process that dinner won’t be served with wine and candlelight, but rather that she’ll be donning an apron and making it. All is well in the end, but those first couple of minutes are nothing short of terribly awkward. While a cooking class makes for a wonderful date night when a couple knows what they are getting into, I recommend keeping Valentine’s Day surprises to things like chocolate truffles that…surprise!…you make yourself. Yes, you can buy delicious truffles for your special someone, but does anything say “I love you” more than chocolate that you’ve taken the time to make. 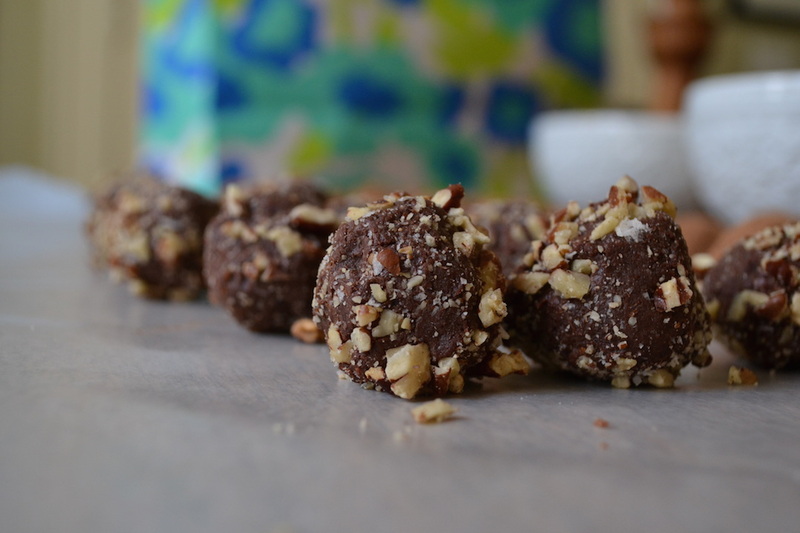 You might think that you need cooking classes to master something like Balsamic Truffles dusted with Cocoa Powder or Bourbon Truffles with Toasted Pecans and Maldon Sea Salt, but I urge you to think again. 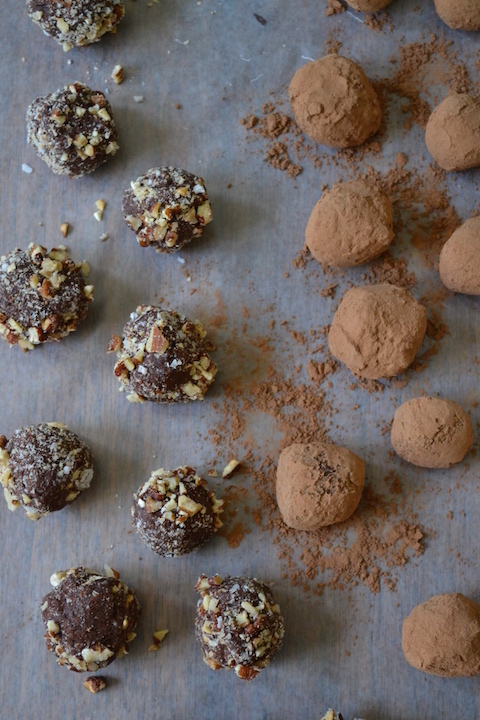 These simple truffles come together easily and once you master the basics allow for plenty of culinary creativity for the inspired cook. And if your edible gift doesn’t turn out exactly the way you hoped? Then maybe it is time for a FOOD LOVE cooking class for the both of you. No one will ever question your devotion if given a box of one or both of these delicious truffles. For the cook looking to make his or her Valentine’s Day gift stand out, use the ratio of cream and chocolate below and add your own flavorings in place of the aged balsamic vinegar or bourbon. Place 6 ounces of bittersweet chocolate in a double boiler or a metal pot over simmering water. Cook, stirring often, until the chocolate melts and is smooth. Once the chocolate has melted, remove it from the heat and stir in the remaining one ounce of chopped bittersweet chocolate until it melts and the mixture is smooth. Meanwhile, in a small saucepan, heat the heavy cream over medium heat until bubbles form around the edges of the pan. Remove from the heat and stir in the balsamic vinegar. Add the cream and vinegar mixture to the melted chocolate and gently stir until just combined. Refrigerate the chocolate mixture for at least three hours. When ready to make the truffles, place the cocoa powder in a small bowl. Once the chocolate has chilled, scoop out balls approximately 2 teaspoons in size and place on a sheet of wax paper. Once all the chocolate has been scooped, gently roll the scoops into balls with your hands (I wore latex gloves for less mess) and return them to the wax paper. 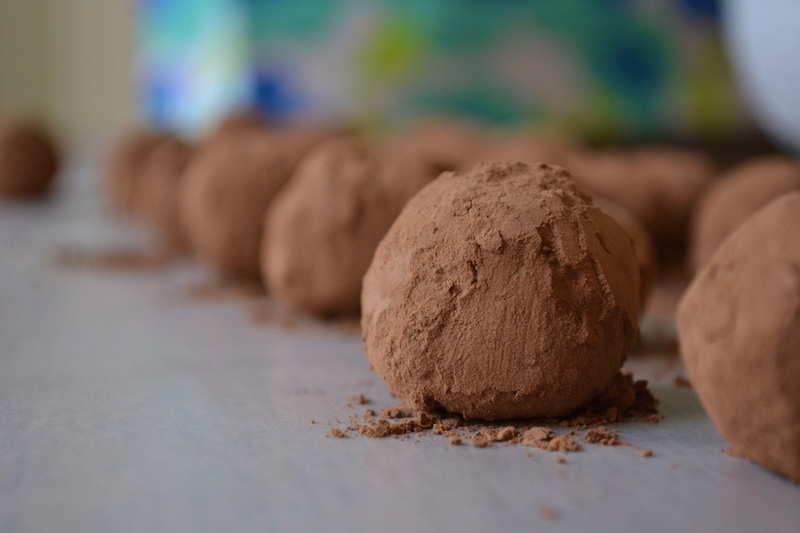 Once the truffles are shaped, toss each truffle in the cocoa powder, dust off excess, and return to the fridge to set. Truffles will last for several days provided they are kept under refrigeration. Place the milk chocolate in a double boiler or a metal pot over simmering water. Cook, stirring often, until the chocolate melts and is smooth. Once the chocolate has melted, remove it from the heat and stir in the ounce of chopped bittersweet chocolate until it melts and the mixture is smooth. Meanwhile, in a small saucepan, heat the heavy cream over medium heat until bubbles form around the edges of the pan. Remove from the heat and stir in the bourbon. Add the cream and bourbon mixture to the melted chocolate and gently stir until just combined. Refrigerate the chocolate mixture for at least three hours. When ready to make the truffles, place the finely chopped pecans and sea salt in a small bowl. Once the chocolate has chilled, scoop out balls approximately 2 teaspoons in size and place on a sheet of wax paper. Once all the chocolate has been scooped, gently roll the scoops into balls with your hands (I wore latex gloves for less mess) and return them to the wax paper. Once the truffles are shaped, roll each truffle in the pecan-salt mixture, dust off excess, and return to the fridge to set. Truffles will last for several days provided they are kept under refrigeration. Both your versions are so wonderfully flavored, I wouldn ´t be able to decide for just one of them!